Hi, my name is Georgeanna. I've been a professional hobby breeder for 25 years. I began in 1987, breeding doberman pinschers. Then, 10 years ago, what was supposed to be a present for my son, became so much more. Killer and I became inseparable. I fell head-over-heels for bulldogs! 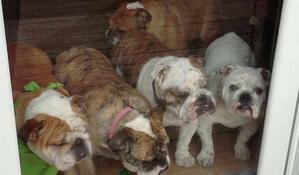 Two years after Killer crossed the rainbow bridge, I went in search of another English Bulldog. I fell in love with two puppies but, had decided on only bringing one home. Her name is Opal. To my surprise, my husband brought Opal's sister home the very next day. We named her Crystal. This is how my current brood began! 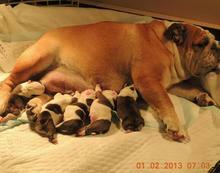 At G's Bulldogs, we breed for temperment and health, as well as conformation according to breed standards. and pick out your new best friend. established lasting relationships with each and every one of my puppies' new families.